How many times have you sent out a Word document for people to recommend changes and they shut off the Track Changes function? It is a pain trying to find every little edit they made--there is no easy way! This Word tutorial will teach you to quickly find the edits that Computer Deficient people made in your document. In Word (2007) there is a feature called “Side by Side” that gives you the ability to quickly compare the changed document to the original. No longer do you have to switch from one document to another, back-and-forth, until your head hurts. Now you can quickly scan the two documents to identify changes and find anything that needs to be switched back! 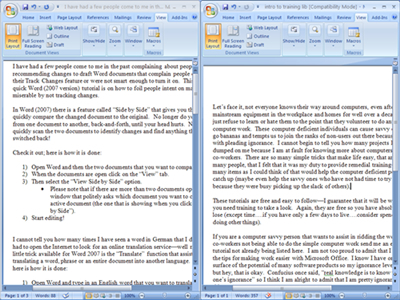 Open Word and then open the two documents that you want to compare. When the documents are open click on the “View” tab. Then select the “View Side by Side” option. Please note that if there are more than two documents open you will get a window that politely asks which document you want to compare to the active document (the one that is showing when you clicked on “View Side by Side” is the active document ). Then simply start editing! This is a lot like the Excel feature that allows you to look at multiple books, only a little better.